We've always been loyal patrons of Pancake House for what seems like forever. I'd remember trips to the original branch beside the old Magallanes Theater right after hearing mass. I would alternate between Spaghetti and a couple of their Pancakes, though more often than not, it would be the former to be shared with my brother. Throughout the years, it has remained one of my go-to places for comfort food. 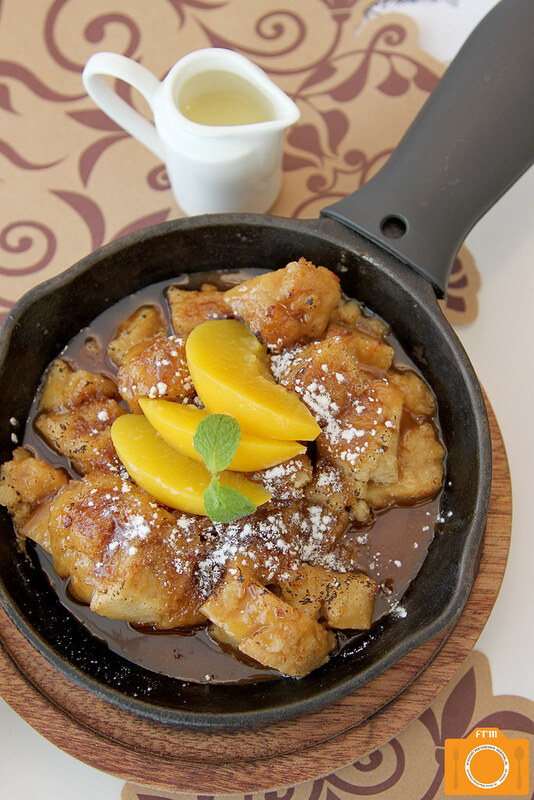 I just have to say that the best Pancake House branch is the one in ATC. Not that I'm biased just 'coz I've been going there since I was in grade school, but really, their food (especially the spaghetti) and their service are both still unmatched by other branches. 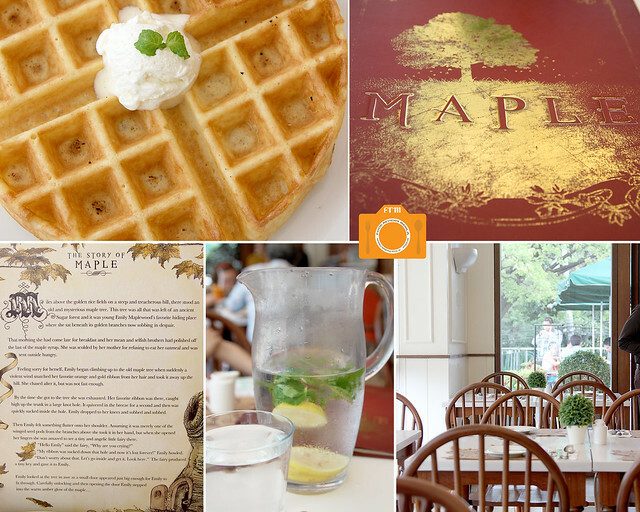 It comes as no surprise that Maple would be in my bucket list after hearing that the same group behind Pancake House is its creator. Armed with an interest in discovering more breakfast places in the metro, I rallied up my mom and daughter for some brunch. 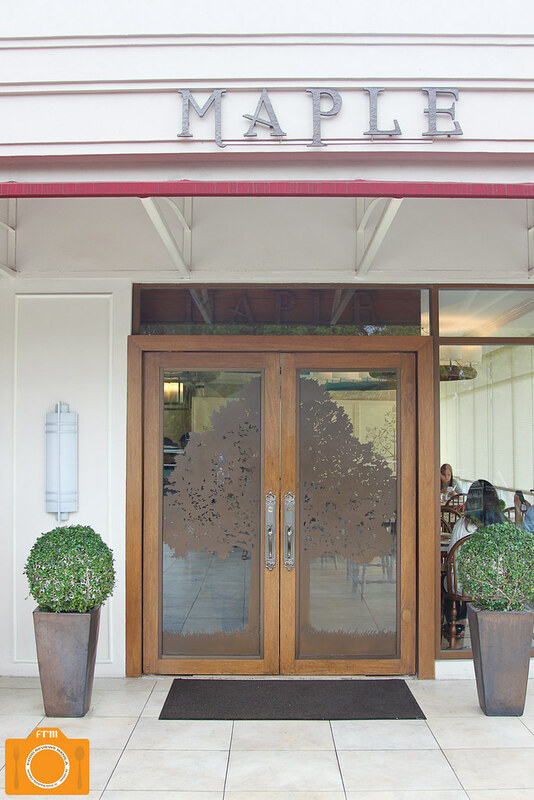 Tucked in the second level of the newly revamped San Antonio Plaza Arcade, Maple can seat about 8 - 10 groups inside, and 3 more at their al fresco dining area. 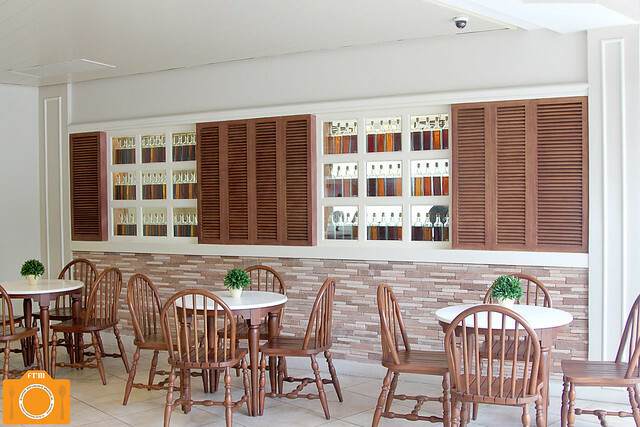 A huge maple tree decal on the wooden-framed glass doors serves to welcome you. The whole place seems to be a bit cramped when you take notice of how closely the tables are put together, but then the splashes of sunlight coming from the picture windows pretty much make up for it, making the place brighter and somehow bigger. 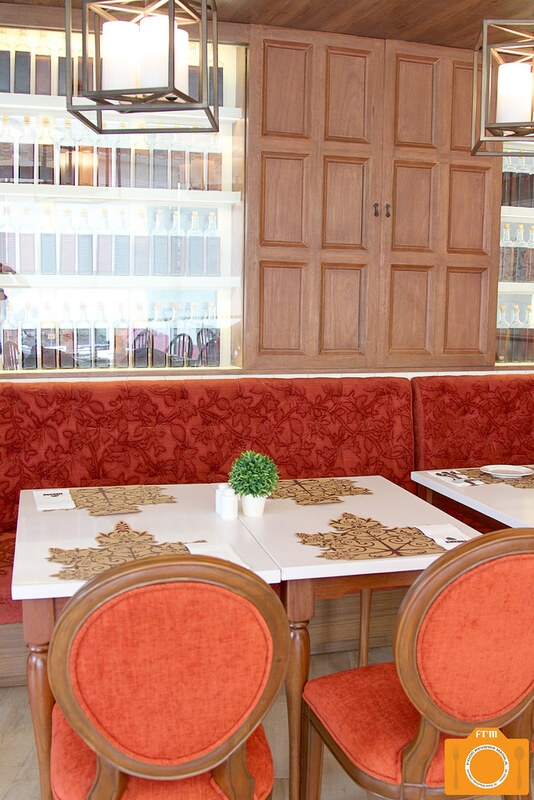 The interiors are a smattering of wood, orange and crimson. 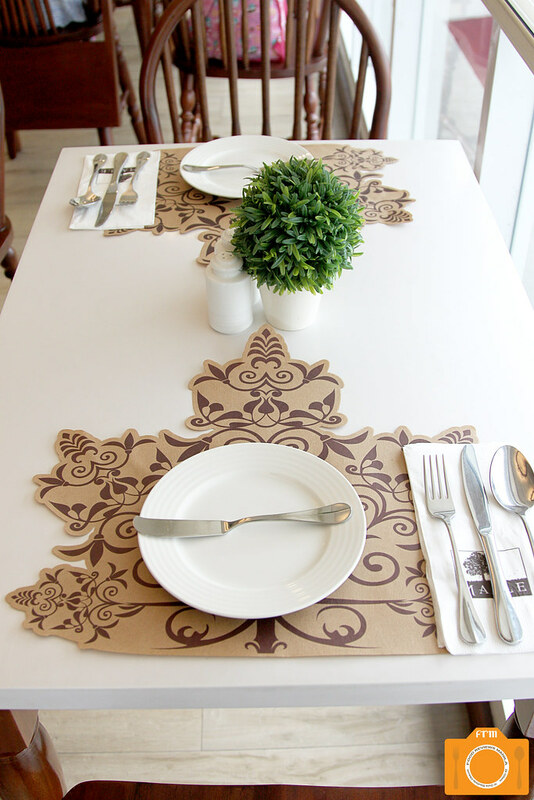 Even the placemats follow the shape of a maple leaf. Rows of different maple(?) syrup dressed in different hues sit by the window. The menu is reminiscent of an old hardbound book---the collector's edition kind---with a deep mahogany and gold finish. Inside is a short story of Maple and a little girl named Emily Maplewood. The prices might come as a bit of a shock, especially when you're used to Pancake House's, but do remember that the servings are damn big, and almost everything can be shared by at least two people. The Big Maple Breakfast actually includes either three buttermilk pancakes or one giant Belgian waffle, and I chose the latter just because. Next time may be a different story, but then I liked the waffle so much so we'll see. Yes the waffle was pretty big, but what won me over was that it had this slightly crisp exterior that gave way to a tender interior that was light and buttery as it was warm. 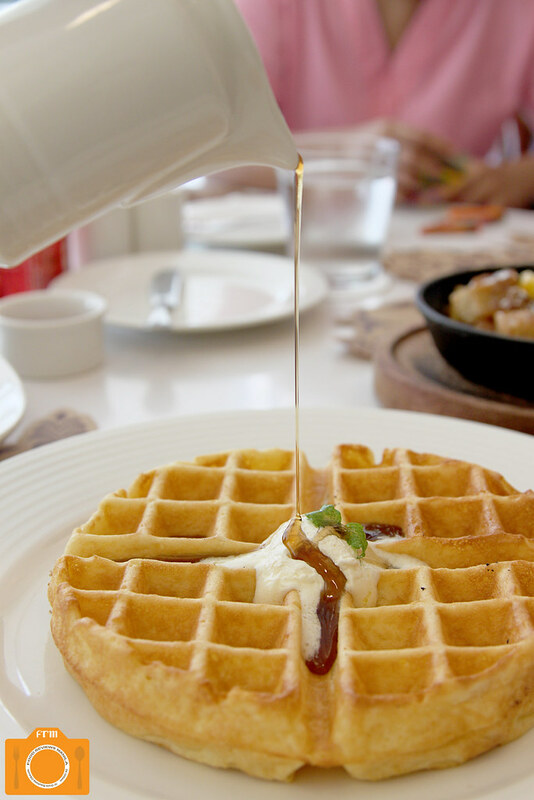 It was kind of like an elevated version of Pancake House's own waffles. I kept on dabbing each bite with that melting buttercream, and dousing each one in that classic pancake syrup. Maple bacon, breakfast sausage, country fries and two farm fresh eggs, also part of The Big Maple Breakfast. This big breakfast did not end there. 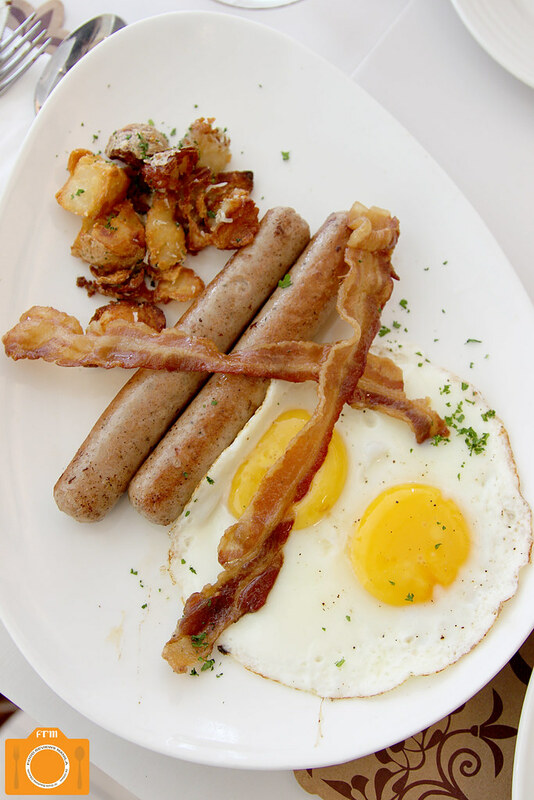 It also comprises two strips of Maple bacon, which had this hint of sweetness amid its slightly salty character; two breakfast sausages---tender, juicy and savory---much smoother in consistency than local sausages; country fries that were perfectly crisped and certainly addicting; and finally, two farm fresh eggs cooked however way you liked. We didn't expect the beef to be this big; it was humongous! The meatiness was apparent, and so were the tasty fatty portions that came with it. Bold and beefy in every way, the tapa had this robust taste that was salty enough to get your appetite going. There were, however, some sinewy parts that were still forgivable if you just continue to focus on the taste. 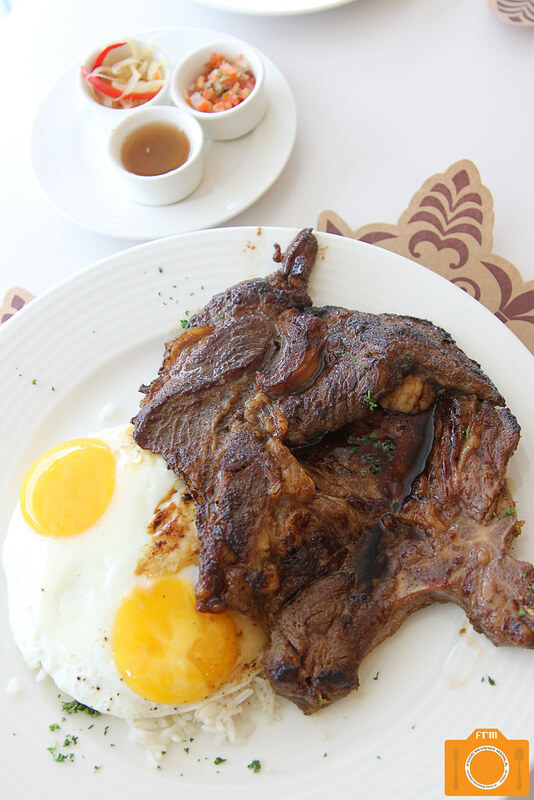 With two eggs and rice, this is definitely one hearty meal -- one that you would actually crave for. I don't know what came over me. Perhaps due to several missed opportunities of trying out some bread pudding in hotel buffets, or maybe it was just too good looking in its menu picture to pass up, whatever it was that made me erringly decide to go with this for dessert, suffice it to say, I wasn't happy. Not that it was bad, it was actually nice, but obviously way too sweet for my taste. 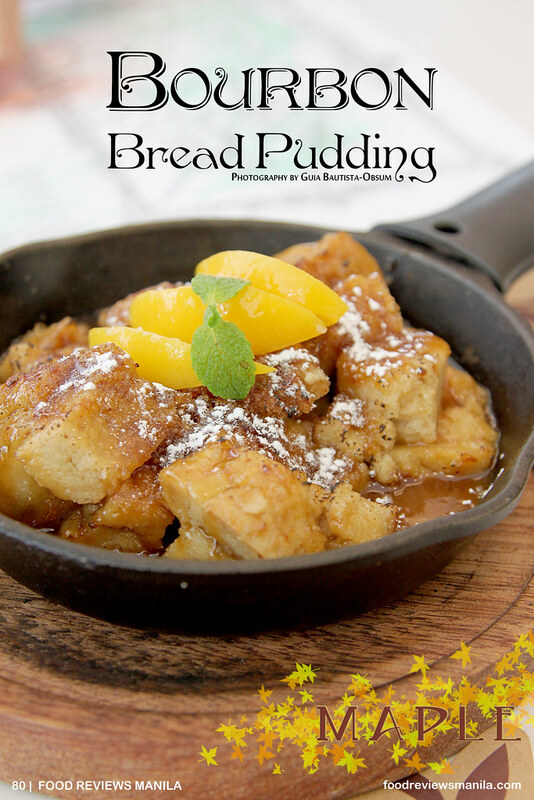 I always skipped bread pudding in buffets for a reason, and apparently, somewhere in my excitement, I temporarily forgot. All I wanted was to have that beautiful dish, sadly at the expense of my savory tooth. If I had a sweet tooth, this would have been a different story. Thick slices (chunks, really) of sweet bread, softened by the Bourbon sauce they're drenched in, lay in a heap in the middle of a black iron skillet. Atop is a splattering of confectioners' sugar, as well as three slices of peaches. The rich, toothsome sauce satisfies all your saccharine cravings. Unfortunately, it's just not for me. In retrospect, I should have opted to have it ala mode to lessen the sweetness I suppose. 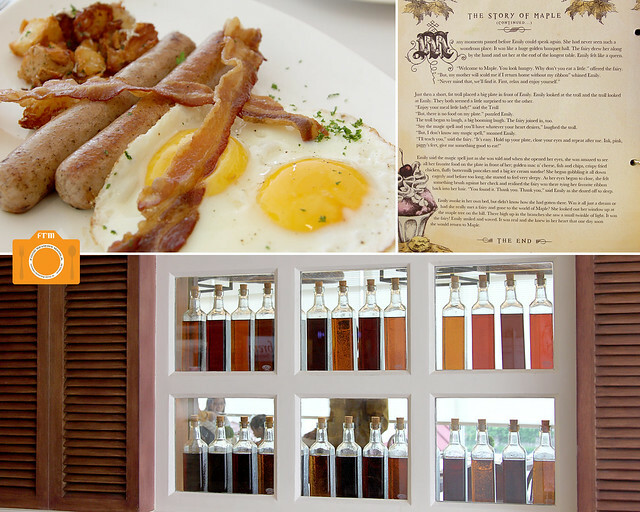 Maple's breakfast items are spot on, if you could go past the prices. If you really think about the serving portions, though, they become pretty reasonable. Dine with a friend so you can share both the food and the bill. As for the desserts, I think I have to go back and try some other stuff. I still see a few more main dishes I want to try anyway. This post was mouth watering! Now I want to try that out.. the ambience is so quaint and cozy. I too wanna try the Prime Beef Tapa!